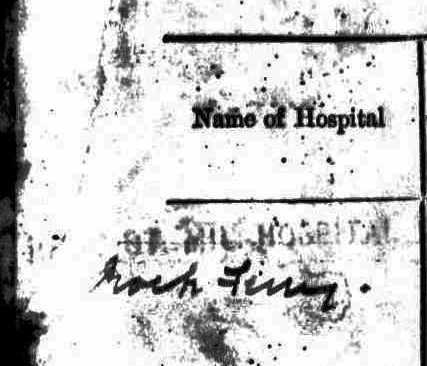 Walter Francis Fenn was born to parents William Robert Thompson Fenn of Little Ryburgh, born 1864 and Laura Cousins of South Creake born 1870. From the 1891 Census return we can find that Laura had been a domestic servant at the Lord Nelson Public House in Fakenham prior to their marriage in 1892. Walter is in the Little Ryburgh Registers having been baptised on July 7th 1893. He was the second eldest of 10 surviving children, 5 sisters; Edith, Minnie,Miriam, Ethel, Violet and the youngest Nelly (born 1910) and 4 brothers; Frederick, Frank, Robert and Norman. In the 1911 Census Robert and Laura Fenn are living at Old Toll Bar Farm, Stibbard and Walter’s occupation is given as a farm labourer. 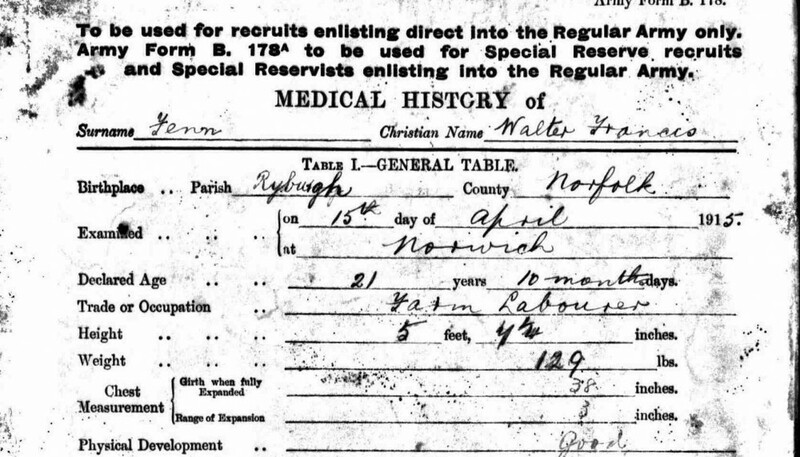 Walter enlisted on 15th April 1915 in Norwich at the age of 21 years and 10 months, initially in the Norfolk Regiment, though very shortly after he transferred to the 2nd Border Regt. He disembarked in France on the 30th December 1915 and operated in the Ploegsteert area in Belgium. On the 26th January 1916 his Battalion moved to the rear to Strazeele for further training and refresher training in their duties. They also used this time to engage in sporting activities. ECOUST was again reported by aeroplane to be evacuated. Daylight patrols were therefore ordered to be sent out. 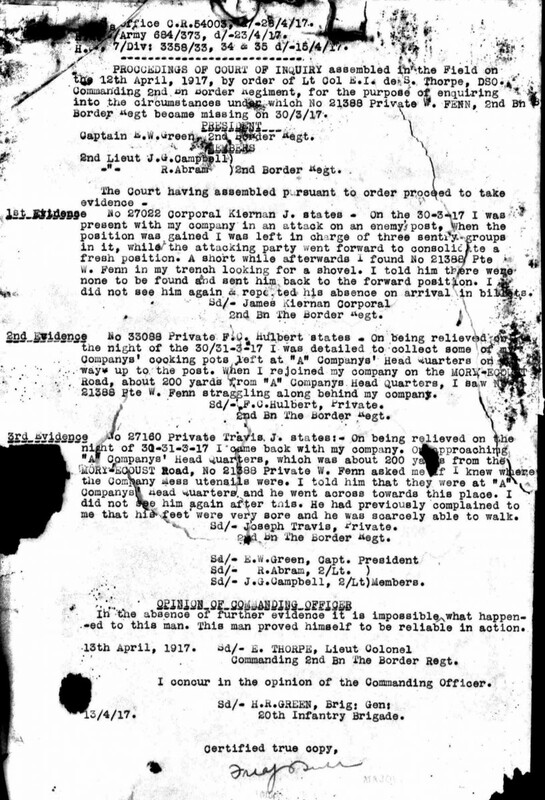 "B" Company under Lieut. R. MAXWELL was detailed for this duty. As "B" Company advanced across the plateau in B23.a and B17.c they came in full view of the enemy & were heavily shelled suffering several casualties. During the night 30/31st "B" Company attacked a post at C.7.a.5.5.under an artillery barrage and took it. They were temporarily blocked by a small bombing post at C.7.a 65.45. This check enabled the enemy in the Strong Point to withdraw. The occupants of the bombing post were however killed. A simultaneous attack had been planned on an enemy post at C.8.c.0.7. "D" Company was detailed for this duty. This Company had first to be relieved by a company of 2/1st HAC and were late in starting because this relief could not be completed in time. 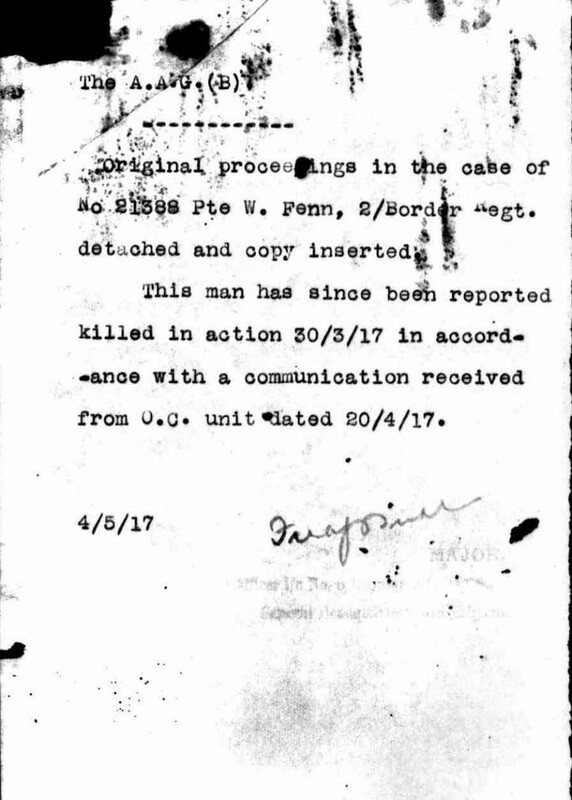 The consequence of this was that "D" Company could not get near enough to rush the post when the barrage lifted & when they did get near it they were held up by machine gun fire from the post. When however the post at C.7.b.1.8 was captured the occupants of the post at C8.c.0.7 retired. Two posts were established at C.7.b.1.8 & C.8.a.3.2. 1 officer killed, 1 wounded, 10 Other Ranks killed, 35 wounded and 15 missing (one of these would have been Walter at that time). Reading this, one can understand how someone can easily go missing under these conditions and for nearly 2 weeks Walter was listed as “missing in action”. After the enquiry he would have been as declared as “dead”. Walter has no known grave and is commemorated on the Arras Memorial to the Missing and his name inscribed in bay 6. “The past month has been a sad one for Ryburgh. Three of our "boys" have laid down their lives for us at the Front, namely Frederick John Bone, Walter Fenn and Percy Neale, and to their relatives, and in this I feel sure I voice the feelings of you all, when I extend to them our very deepest sympathy”. In 1901 the family were living at Burrow Hill Cottage in Little Ryburgh. By 1911 he was already in barracks at Weedon in Northants with the 16th Lancers aged 20. From his Medal Index Card we can read that he first served in France from 17th October 1915 and became a Class B reservist as of 5th May 1919. 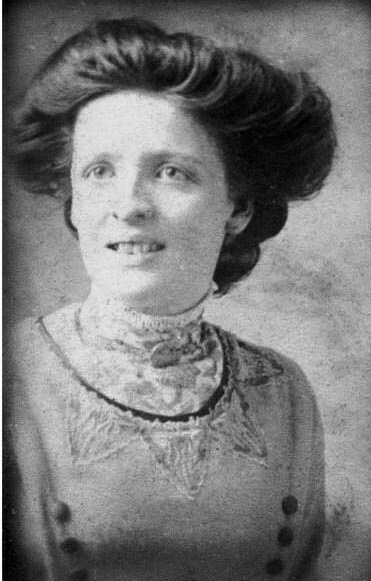 He married Gertrude Mary Lincoln also of Little Ryburgh in 1920.